Do you have a good relationship with your mother-in-law? 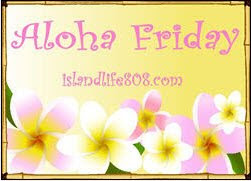 *my Aloha Friday's up too! Not so much. We're polite and friendly, but not . . . well you know. Actually my husband doesn't have a good relaitonship with her either. Her choice not his. Sad. Yes, I am blessed to have a good relationship w/ her. Of course, nothing is perfect, but she is so laid back, it makes it very easy!! I also have a good relationship w/ my father in law as well. When she was alive we did. Now that I've learned how to take things with a grain of salt...yes. My mother-in-law has never forgiven me for getting my hubby to move here and not stay by them. I know everything in her mind is my fault. When we see her and my FIL they behave in person. Nope. After 18 yrs of marriage I've learned to respect what she's done & who she is (mom to Hubby & grandma to my kids although she doesn't even try to do those jobs) & let the rest go. That being said I always have horrible nightmares before we visit but thankfully those are extremely few & far between. I get a long well with my MIL, there has been times I would disagree with her. But, she is a very generous woman who has helped us a lot. I kinda do. I wish it were better, I am trying to just let things go. But it's hard sometimes! I have the BEST relationship with my mother in law...almost closer than my own mother :) She helped me plan for 95% and pay for 60% of my wedding....all my mom did was buy me $5 worth of candles as a wedding gift! I love my mother in law so much! We have lunch once a week...she's amazing! My mother in law is no longer with us but when she was, we got along but weren't close at all. My mother-in-law begged me to marry her son even before I had met him...we've always had a great relationship and are as close as in-laws could be. I count myself lucky and truly consider myself her daughter. We love your blog and want to give you the "One Lovely Blog" Award! Come pick it up at http://layers-of-learning.blogspot.com and post it on your site! Thanks for much enjoyment and many great posts! I am going to go with NO! I wish I did but since I am not the "right color" I don't see it happening!! Sad but true! For the most part yes we do. I often get mad at her for doing stupid stuff with my kids. She still thinks it is the 70's and the world hasn't changed. But besides that we get along well. she's okey. she's very caring actually but she doesn't hover, which i like very much. i have no complaints! Simply and sadly the answer to your question is "no"